As Spain struggled to sell short-term debt this morning in an auction that showed how desparate the situation is becoming, the bond spreads to Germany hit a new high. 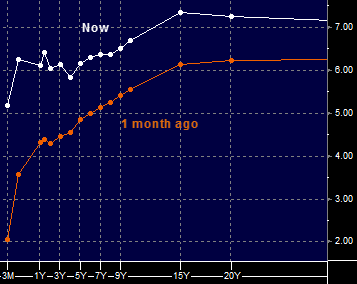 Spain's government bond yield curve has flattened dramatically in the last month, approaching inverted levels. 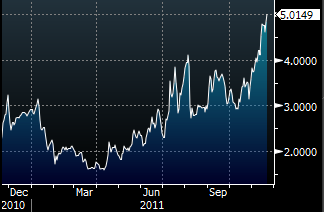 This curve now looks like a junk/stressed corporate credit curve. These levels are not sustainable as the government's interest expense will spiral out of control and corporations simply will not be able to borrow. What adds fuel to the fire here is that Spain's unemployment rate is 21.5% with some 5 million unemployed. Restructuring/default seems inevitable.